Many individuals would like to start their investments when they have a large sum to invest. They believe investing a small sum regularly will not help them to meet their ambitious long-term goals. That is why many of them defer their investments indefinitely. However, they would be surprised to know that investing merely Rs. 5,000 through a monthly Systematic Investment Plan (SIP) in an equity scheme would help them to create a corpus of Rs. 1 crore in a little over 20 years. Investing in an equity mutual fund scheme via an SIP is the best way to achieve your long-term goals. Equity has the potential to offer superior returns than other asset classes. It may also help you to beat inflation which is essential to achieve long-term goals. They also enjoy favourable taxation. If you can spare Rs. 5,000 every month, start an SIP immediately in equity mutual funds. If you need help with selecting schemes, you can check our recommended equity mutual fund portfolios and pick a portfolio based on your risk appetite and SIP amount. However, this is not an ideal way to invest. You should try to increase your investments in tandem with your income. Let us assume that you may be able to increase your SIP allocation by 10 per cent every year. 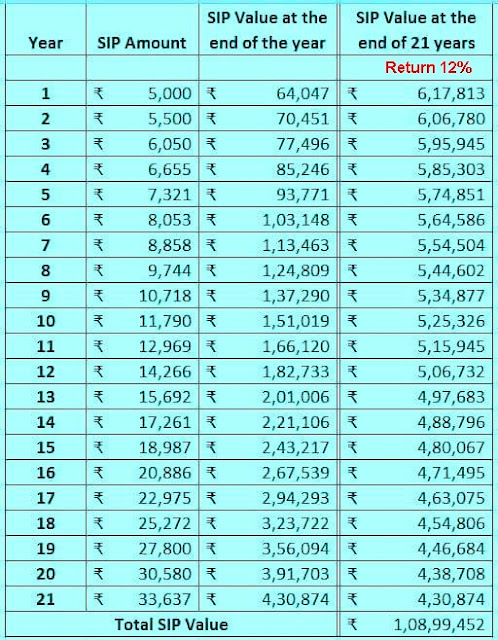 So, in the first year you will have an SIP of Rs 5,000 per month, in the second year it will be Rs. 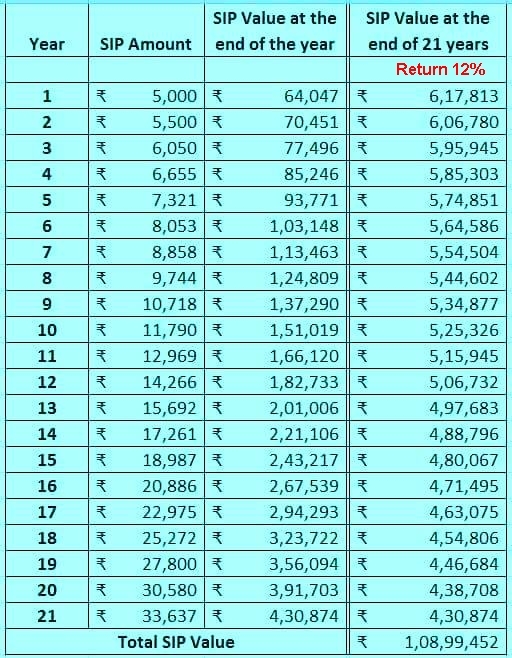 5,500 (Rs 5,000+10% of Rs 5,000), in the third year it will be Rs. 6,050 (Rs. 5,500 + 10% of Rs 5,500 .. This will help you to meet your target corpus of Rs. 1 core in 21 years.